Oakland has 8,641 units of housing under construction. Oakland didn't build much new housing from 2009 to 2016, but in the last two years the city has experienced a historic housing construction boom. According to the Oakland Mayor's Office, as of December, there were 8,641 units of housing under construction in The Town, with another 7,898 units in the pipeline (approved or proposed). When those apartment buildings and high-rises are completed, Oakland not only will have a new skyline, but the city will have easily surpassed its regional housing goals for the next five years. But only for market-rate housing. Like cities throughout the Bay Area and the state, Oakland continued to have trouble in 2018 financing the construction of affordable housing — at a time when high rents and home prices are displacing increasing numbers of longtime residents. As of December, 462 units of affordable housing were under construction in Oakland, or just 5.3 percent of the total number of housing units being built. Another 1,341 affordable units are in the pipeline, but it's unclear when the developers of those units will obtain the necessary public subsidies to pay for them. "There are a lot of affordable units in the queue, but it comes down to financing," said Darin Ranelletti, who is Mayor Libby Schaaf's housing policy director. Schaaf and other city officials are banking on new revenue streams in the 2019 and beyond to help fund more affordable housing in the city. 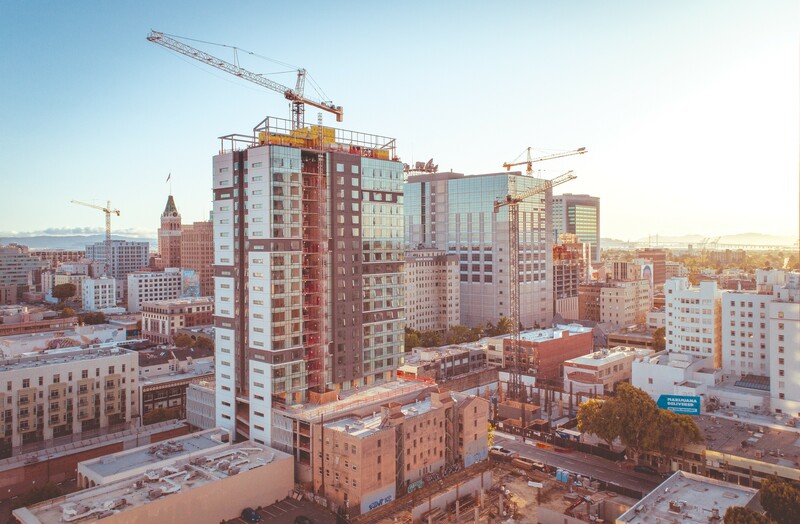 In November, California voters approved Proposition 1, a $4 billion affordable housing bond, and Oakland will be eligible for substantial funding from the measure. In addition, Oakland voters on Nov. 6 approved a vacant property tax and an increase to the city's tax on real estate sales for high-end homes. The two measures are expected to generate a total of nearly $20 million a year, with much of it earmarked for services and programs for unhoused people. Oakland is also in line to finally receive significant funding from Alameda County's $580 million affordable housing bond, approved by voters in 2016. And the city is already spending funds from a 2016 ballot measure that set aside $100 million for new affordable housing and for keeping existing housing affordable. Plus, the city, in the past couple of years, has been collecting impact fees from market-rate developers in order to help finance more affordable units. But all that likely won't be enough to meet Oakland's huge demand for affordable housing. So, Schaaf has been a leading advocate for the ambitious new Bay Area regional housing proposal, known as CASA. It calls for $1.5 billion in new taxes to finance affordable housing in the area. "We're starting to see the need to build housing like it's infrastructure — just like we need roads, sewers, and public utilities," Ranelletti said. The CASA compact calls for producing 35,000 units of housing each year in the Bay Area to address the region's extreme housing shortage and skyrocketing prices. Since 2010, the Bay has added 722,000 jobs but only 106,000 housing units, creating a massive supply-and-demand imbalance, and thereby sending rents and home prices soaring. The compact, which is based on Oakland's three Ps — produce, preserve, and protect housing — also aims to preserve 30,000 affordable units and protect 300,000 low-income households from displacement. The pact also calls for overhauling city zoning rules that block apartments near major transit stops. Oakland voters in November also elected new pro-housing councilmembers Sheng Thao and Loren Taylor, who both advocate for increased density near transits. And another new councilmember, Nikki Fortunato Bas, is a strong advocate for affordable housing. Berkeley has also faced difficulties paying for affordable units. The city has the highest impact fees on market-rate housing in the East Bay, but in the past two years, anti-housing councilmembers and zoning board members have repeatedly blocked or slowed new market-rate housing, thereby rendering the high impact fees useless. But good news came on Nov. 6, when city voters approved a $130 million affordable housing measure. Berkeley voters also OK'd a tax hike on real estate sales of expensive properties — much like Oakland did. That measure is expected to raise $6 to $8 million a year for homeless services. Berkeley Councilmember Lori Droste said she thinks the Nov. 6 election in Berkeley signaled a shift away from NIMBYism — anti-housing sentiment that has plagued Berkeley politics. Berkeley residents elected two new pro-housing councilmembers: Rashi Kesarwani and Rigel Robinson. "There's a little bit of a shift with the election of Rigel and Rashi," Droste said. "I think they're going to be strong advocates for more housing in the East Bay." Earlier this year, the council approved Droste's measure to make it much easier to build affordable housing in the city. And Mayor Jesse Arreguín, who has a history of opposing housing proposals, has recently voted in favor of them. Little Emeryville, however, may have done more than any other East Bay city for affordable housing in 2018. In June, Emeryville voters approved a $50 million affordable housing bond — a massive sum for a tiny town with a population of less than 12,000. Councilmember John Bauters, who was mayor of Emeryville in 2018 and who, like Droste, is pro-housing and pro-tenant, noted that the city will be able to use the new bond money to leverage more regional, state, and federal funding for affordable housing. Still, like Schaaf, Bauters believes that the Bay Area needs to start looking at housing from a regional perspective, because too often individual cities and neighborhoods block housing proposals and refuse to allow apartment buildings, often because of NIMBY fears over traffic and parking. "We have to stop being 101 little kingdoms," Bauters said. "And we need to start dealing with housing regionally." Alameda, meanwhile, also elected a pro-housing, pro-tenant mayor, Marilyn Ezzy Ashcraft, and pro-housing politicians now hold a 4-1 supermajority on the council. However, the city has yet to attempt to pass ballot measures to finance more affordable housing on the Island. In good news for renters, Alameda voters soundly rejected Measure K, a landlord-backed initiative that sought to enshrine the Island's weak rent stabilization ordinance in the Alameda City Charter. The Alameda council is expected to take up just cause eviction protections in 2019. Oakland voters on Nov. 6 also approved extending just cause eviction protections to owner-occupied duplexes and triplexes. And earlier in the year, the Oakland City Council approved relocation assistance payments to tenants who are evicted when a property owner decides to move in to the home. On the state level, voters soundly rejected Proposition 10, which sought to overturn the Costa-Hawkins Act, which restricts the ability of cities like Oakland and Berkeley to enact tougher rent control rules. Prop. 10 only passed in two counties statewide: Alameda and San Francisco. However, the state Legislature approved Assembly Bill 2923, which was signed into law by Gov. Jerry Brown in September, allowing BART to greenlight dense housing on agency property near its train stations.